This project starts in 2012, in eTwinning1 with two teachers: one from Italy and other from Portugal. In eTwinning it is possible to add partners to projects we add two new teacher from France and Slovenia. All the teacher invoved were eTwinning ambassadors and we knew what we wanted to achieve, so we decide to apply to as Erasmus + KA2, because we felt that it was important to our students to develop skills such as communication and collaboration, critical thinking, creativity, problem solving, self-esteem and work with more advanced tools in the IT world, like microcontrollers, robots and real programming. 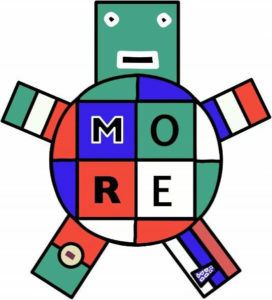 “MORE – MObile Resources on Education: let´s learn with each other” was a project carried out from September 2014 to August 2016, that joined specialized teachers in different field of education, such as robotics, microcontrollers, mobile apps programming and Math and Science from primary school. Teacher aimed to spread their knowledge to increase the students’ participation in learning and better prepare them for their future jobs or career all over Europe. France helped with the installation of microcontrollers with some sensors to collect data like temperature and humidity, movements, sounds detector, light intensity and other in order to measure some characteristics of the environment; Portugal programmed in Visual Studio and APP inventor to acquire that data to a database; Italy adapted microcontrollers to a moving “sensitive” Robots and older students from Slovenia learned from partners and act as tutors in their country to teach colleagues and children from primary school. Also children from primary school act as “beta tester” to Math and Science apps. We used new methodologies with scenarios and project base learning approaches were students’ responses to real-world problems working in teams with students from all countries. Teacher created a secret facebook group for students communicate and interact with each other, but also to work between the mobilities. Students had to investigate how to solve some problems and share their learning in each mobilities, where they were responsible to prepare workshops to other colleagues and teachers. Although teachers were there to support if needed, students were the tutors of the workshops, so previously they had to gain new knowledge, understand new concepts and work in teams, decide, find solutions, prepare recourse and tutorials and apply their learning in new contexts and develop their collaboration and communication skills through the workshops, by presenting their work to partners and also teach them to use other devices. In Portugal, for the first time in our school we had a success of 90% in a professional course, usually student dropout school in a much higher rate. 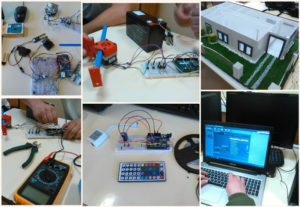 Learning to work with robots, microcontrollers (Arduinos) gave them new ideas for their final project course. Today students are much more responsible for their learning, achieve a different level of initiative and are also more openmind to new culture. Our project as all information available here. Also can check the project info here.